Trillium Falls is not a towering waterfall, leaping hundreds of feet off a granite cliff face. In fact by most standards its fairly small cascade. 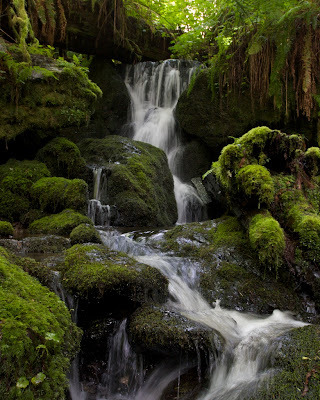 It is however once of the few waterfalls in redwood country. 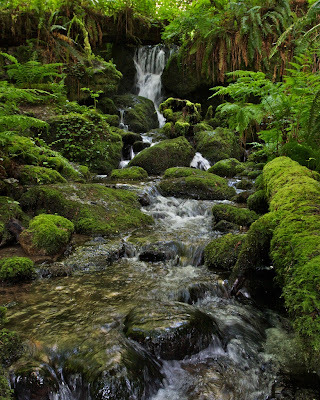 It's mossy rocks, lush stream banks, and cold clean water sparkles with a fountain of youth like aura, what it lacks for in power it clearly makes up for in charm. 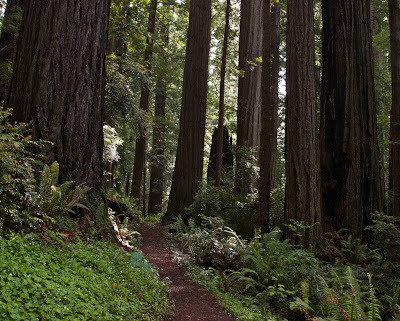 Its perfect for a morning hike as the sun will stream in through the redwoods on the east facing slope the trail follows to reach the falls. The trail begins in an open field near the parking lot, it is not uncommon to see elk resting in the field or chewing on the grass there. 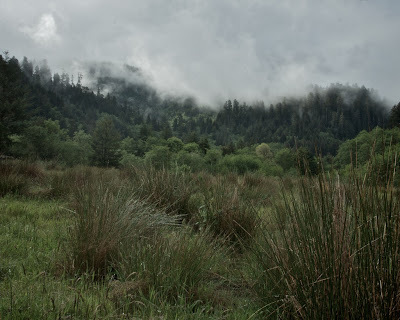 The Redwood covered mountains behind the field often of the classic whisps of cloud hanging on their shoulders, trapped there, remnants of a clearing storm. 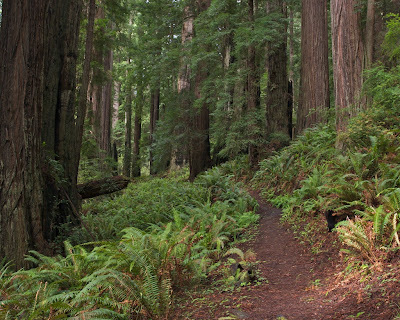 Ahead, up the trail crosses Prairie Creek a couple of times before climbing up into a dense redwood forest. The trail continues gently up for awhile, zigging and zagging in and around the giant trees. I kept a watchful eye on the tree tops, hoping to spot a bald eagle nest. The national bird has a habit of building nests in the tops of dead trees and this was Bald Eagle territory. As the trail cut through, undulating up and down on and on, I couldn't help but notice how well lit is was in comparison to the other redwood groves. Perhaps because a younger forest, or because of the proximity to the forests edge, but the brighter forest was a nice change of pace from the dark, cathedral like, old growth forests visited earlier in the trip. Eventually though the trail rounds a corner to the sound of rushing water, the unmistakable sound of a waterfall. Trillium falls largest drop is perhaps no larger than 8 feet, but the entire cascade ends up being about 20 vertical feet tall, no minor riffle in the creek. In the spring, at the time of our visit, the water was running swift and the flow was at its peak. Placing a boot at the base of the falls while trying to get a photo turned out to be a mistake as the velocity nearly pushed my foot out of place. A bridge behind the falls provides a good viewing platform for those without a desire to get their feet a little wet. After departing the waterfall we continued along the trail for only about another quarter mile before returning to the small paved path we began the hike on, and soon after that found outsides in the parking lot, starting down an 8 hour drive back to the bay area. The easy 2.5 mile Trillium Hike was a prefect hike for the morning before our departure and sent us off in high spirits (although also slightly sweaty spirits...) onto the road. This is a great spot, there are loads of trails for all different levels and tastes. This time when we visited there we hiked the Skunk cabbage Trail, we traveled to about two mile to the overlook and when we back we went to the beach down there. During the summer the popular trails can be busy but you can easily escape the crowd just visit the headquarters where the friendly and experienced rangers will help you pick the best route for you.